Although not part of the old parish of Nonington the small adjoining parish of Knowlton has had close connections to Nonington over the centuries. Since the 1670’s the Knowlton estate has included Kittington, a manor and estate adjoining Knowlton parish in the north-eastern corner of Nonington. 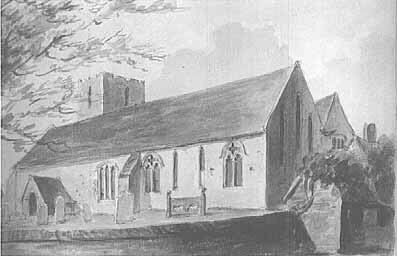 Knowlton, often written as Knolton in the past but I will use the modern spelling, was once an ecclesiastical and civil parish in its own right. The former was abolished in 1940 and the latter in 1935 and the hamlet is now part of the civil parish of Goodnestone-next-Wingham. The Church of St Clement, which adjoins Knowlton Court House, is now redundant and has been in the care of the Churches Conservation Trust since 1st December, 1991. 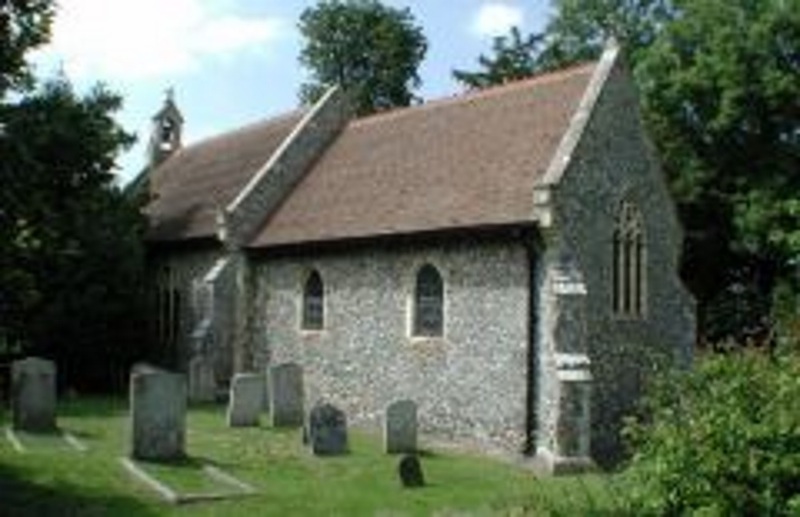 It was originally built as a private chapel for the manor house and later becoming the parish church. St. Clement’s still contains several fine monuments to the various families that have owned the estate over the centuries. In 1855, the architect William White carried out a restoration replacing the windows, pulpit, box pews and chancel gate. 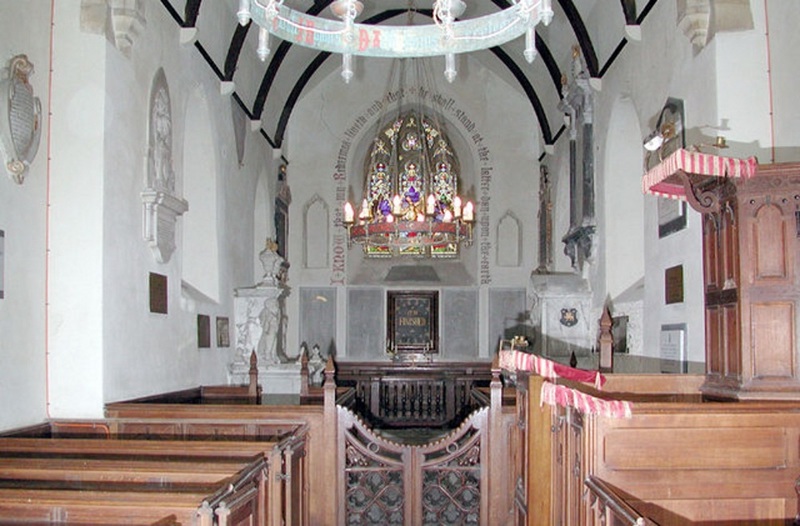 The interior of St. Clement’s Church, Knowlton. Around 1800 Knowlton was recorded by Edward Hasted in his history of Kent as extending to some 432 acres, virtually all of which were part of the Knowlton estate. The hamlet consisted of the mansion house and its adjoining building and the parish church and the mansion once had its own cricket ground. A mile or so east of the mansion was Knolton Station, a stop on the single track East Kent Light Railway, one of the Colonel Stephens group of cheaply built rural light railways in England, which ran from Shepherdswell Station to Eastry where the railway divided with one line going to Wingham and the other to Richborough. Knolton station opened on 16th. October, 1916 and closed on 30th October, 1948. The platform was demolished and the track taken up in 1954. Knowlton was recorded in the Domesday Book of 1086 as Chenoltone, other ancient records referred to it as Cnoltone. The name is said to derive from the Old English cnoll tun: the farmstead by the hillock or knoll. At the time of Domesday it was part of the extensive holdings of Odo, Earl of Kent and Bishop of Bayeaux, a half-brother of William the Conqueror. After Odo’s fall from favour for rebellion the estate, along with many of Odo’s other land holdings was given to members of the de Albineto [also Albini, Albineo, d’Aubigny, and Albinione] family. Knowlton was given to William d’Aubigny, known as ‘Pincerna’, Master Butler of the Royal Household and the adjacent estate of Eswalt, later St. Alban’s Court in Nonington, came into the possession of his younger brother, Nigel. Cnoltune (Knowlton) later passed into the possession of the Earls of Arundal through Pincerna’s son, William “Strong Hand” d’Aubigny, 1st Earl of Arundal and 1st Earl of Lincoln and then on to the Countess of Eu. The Perot, or Pyrot, family held Knowlton from the Countess by knights service for many years before the estate passed by marriage to William Langley and then his son, also William. Their descendant Edward Langley of Knowlton married Elizabeth Peyton who, after Edward’s death, married Sir Edward Ringley, brother-in-law to William Boys of Fredville in Nonington. After Elizabeth’s death in 1544 Knowlton passed to her brother, Sir Robert Peyton and remained in the Peyton family until after the death in 1684 of his descendant, Sir Thomas Peyton. Thomas Peyton was born in 1613, the eldest son of Sir Samuel Peyton, the first baronet. He succeeded his father as second baronet on his father’s death in 1623 and inherited Knowlton and other property which gave him an annual income of £1,000 but from the beginning was in financial difficulties, in part due to family commitments. A student of Greek and Hebrew, he disliked the increasing ‘pomposities of the clergy’ under Laud, and in 1640 he stood for Parliament at Sandwich, as had his father, and defeated the Court candidate there. Sir Thomas was a moderate Royalist and withdrew from Westminster in 1643, and was later imprisoned and fined £1,000 by Parliament for disobedience. In 1648 he was one of the leaders of the Kentish Rebellion in the Second English Civil War, and incurred a further fine of £900. Despite this Sir Thomas was active as a director of the Royalist Action Group during the Interregnum and during the intervals between periods of imprisonment devoted himself to Royalist conspiracy and to ‘the business of farming, which notwithstanding will never repair the breaches made in my fortune by the evil of persons and times’. The decimators [collectors or receivers of tithes then valued his estate at only £540 p.a. Despite his misfortunes he was ‘an excellent husband to two very different wives’. After the Restoration of King Charles II in 1660 Sir Thomas received some compensation for his losses, receiving some £2,000 per annum from the Newcastle coal tax revenues. He was re-elected to Parliament for the county of Kent in 1661 and during his stay there was involved in some legal proceedings. Sir Thomas died of apoplexy in dire financial straits in February of 1684 and was buried in Westminster Abbey, the baronetcy died with him as he was survived by four daughters and no male heir. 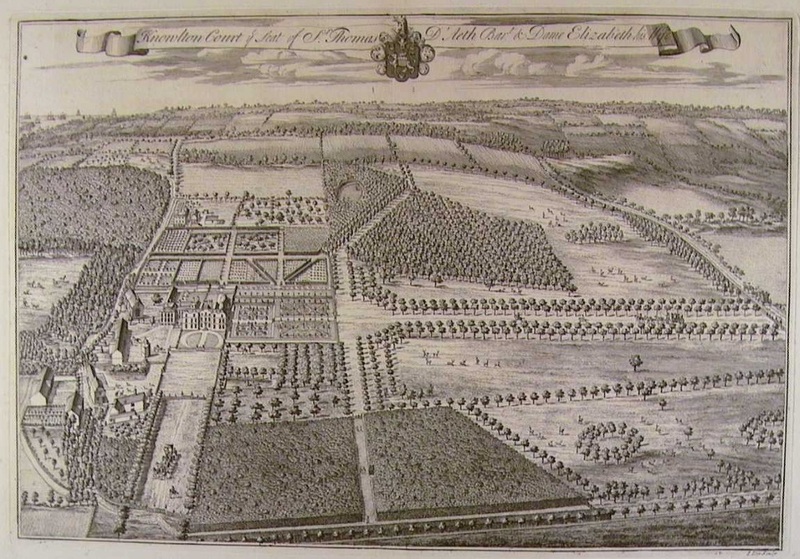 Knolton Court and parkland, 1719. Sir Thomas’s four daughters sold the estate to Sir John Narborough, Admiral of the Royal Navy, who had made a name for himself in the Anglo-Dutch Wars of the 1660’s and 1670’s. Sir John’s two sons, Sir John and James Narborough, were both drowned along with Admiral Sir Cloudesley Shovel when their ship and three others en route home from Toulon foundered during a very bad storm on rocks off the Scilly Isles on 22nd October, 1707 with the loss of over 2,000 sailors lives. This disaster was caused by the inability of the ships navigators to calculate their longitude with any accuracy and so were unaware of how close they were to the rocks. The losses resulted in the passing of the Longitude Act of 1714, in which the British government offered a reward of £20,000 [present day value around £2.85 million] to who ever invented the first accurate marine chronometer. This was finally achieved after many years work by John Harrison who was rewarded by Parliament in the 1760’s. 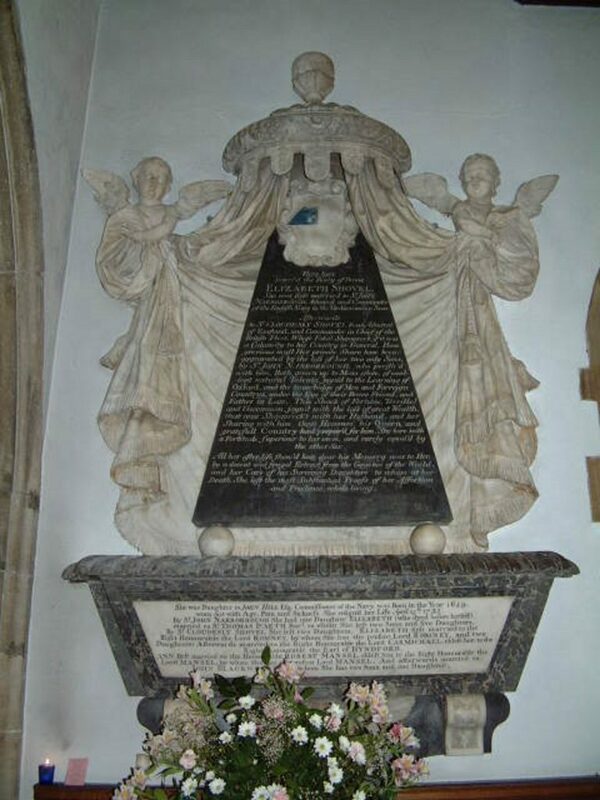 The memorial to the Narbough brothers and Sir Cloudsley Shovel, St. Clement’s Church, Knowlton. The Narborough brothers both died without heirs and their property went to their sister Elizabeth, who was married to Thomas D’Aeth, esquire of North Cray, Kent, who was created a baronet by the newly enthroned George I in 1716. Sir Thomas lived at Knowlton and re-built the house originally built by Sir John Peyton in 1585. The Knowlton estate remained with the D’Aeth family until 1904 when Major Lewis Narborough Hughes D’Aeth, born in 1859, sold the estate to Major Francis Elmer Speed, whose descendant still own and live at Knowlton Court. Captain D’Aeth seems to have been in financial difficulties for some time before the sale. In 1895 County Court orders were taken out against him for the payment of bills for repairs to Knowlton Court house and out-buildings on behalf of the estate of Henry Maxted, a Nonington builder. At that time Captain D’Aeth was serving with the 3rd battalion Royal Scots Fusiliers, at Ayr in Scotland. The 3rd battalion was a militia battalion, acquired by the regiment under the Childers Reforms of 1881. He later appears to have moved from Knolton Court to the nearby Eythorne Court, possibly renting out the much larger Knowlton Court. In 1897 ownership of the Griffin’s Head public house at Chillenden was transferred by Major D’Aeth to Maj. Gen. Craster Lambert, Lt. Col. Henry Smith and Alexander Browne of Doxford Hall, Chathill, North Humberland (and Callaly Castle, Northumberland). The D’Aeth crest was “A griffin’s head, or, with a trefoil in his mouth, vert”, and the pub had been called The Griffon’s/Griffin’s Head since 1724. Royal Scots Fusiliers. N. H. D’Aeth resigns his Commission ; also is granted the honorary rank of Major, with permission to wear the prescribed uniform on his retirement. Dated 18th May, 1898”. Possibly he resigned his commission because of debt, possibly to fellow officers or because it had become an embarrassment to the regiment. Another possible reason for the transfer of the properties is that he transferred ownership to fellow army officers to avoid the property being seized and sold to recover debts and after the financial crisis had been resolved was returned to his ownership. 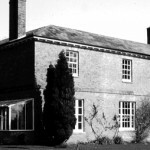 At the time of purchase or shortly after Major Speed bought the Knowlton estate the properties were returned to its ownership where they still remain.